Copper in the Arts: Issue #111 - Handcrafted Copper Gaslights, Matthew Barney's Redoubt Exhibit, Boston's new MLK Sculpture, Jack Whitten, and more. In 1986, Bill Shook was laid off from his job at a company that made grandfather clocks. Little did he know, he would soon start on a new chapter that would become his family legacy. Soho Design by Copper Sculptures. Photograph courtesy of Kimberly Miscal. “My mother was in sales at the time and she linked up with someone who was in need of a gaslight and she pitched the idea of my dad making it,” recalls Kimberly Miscal, Bill’s daughter. Bill Shook set out to make his first gaslight in his garage and now, 33 years later, their business, Copper Sculptures, is a 50,000 square foot operation. 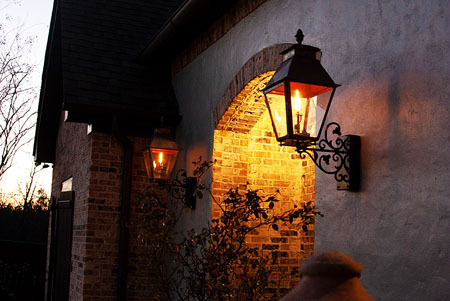 Specializing in handcrafted copper lanterns with open-flame burners, the business is based in Flowood, Mississippi. Copper was the most logical choice when it came to choosing a material for the gaslights. Jeremy discusses how the longevity of copper is another attribute that makes it an ideal metal for gaslights. It was after doing craft trade shows that Bill and Kathy realized gaslights could be the sole focus of their business, which offered furniture and fountains early on. Copper gaslights by Copper Sculptures. “In time they found a niche for the lantern and they started going to trade shows and industry-focused shows,” Kimberly says. Their handcrafted gas lanterns are custom ordered and involve a 6-week labor intensive process. “It takes one person ten hours from start to finish,” Jeremy says, referring to one of their coppersmiths. He discusses the process that is done in what they refer to as their copper room in their manufacturing facility. In addition to their handcrafted line, they also offer a more moderately priced series called Legendary Lighting that offers gaslights that have been riveted together. They offer an accelerated patina for both lines. Their gaslights are suitable for outdoor or indoor installation with their electronic ignition. 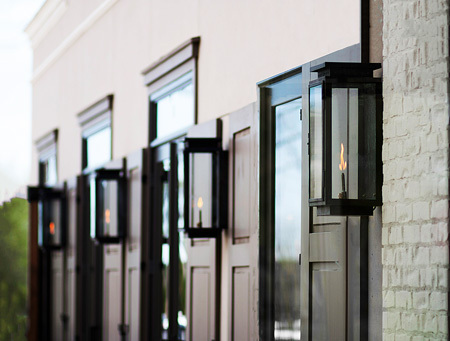 The most common uses for their gaslights are at a front entry, as a lantern, a post light or even to add ambiance in a restaurant. Jeremy explained the outcome of a patina that ages naturally based on the climate to which its exposed. Jeremy discusses the colors related to the natural progression of copper that would occur in a place like Florida where it would be most likely to complete the full patina process. “Getting there, it turns from the original orange copper to red to light brown to dark brown to black to green,” he says. While their widely distributed Legendary Lighting line offers a catalogue full of styles, there are 17 standard designs in three different sizes offered in their Copper Sculptures line. Every one of their handcrafted gaslights can be custom made to the client’s specifications. While they can be sold directly to homeowners, most are requested by architects and interior designers. “If you don’t love what you see off the bat, we can build anything you want, like finials on the top, curls on the bottom or scrolled,” Jeremy says. In order for each gaslight they make to pass all codes and standards, the inner shell of the lanterns is always based on one of their standard designs because they are centered on the fact that for each gaslight to operate properly, it requires a certain oxygen intake to support the flame. “From there, all of the ornamentation can be changed, added or taken away,” Kimberly says. They constantly adjust their designs to the market and what the customer wants. Their offerings today have evolved since the traditional look of Bill’s original designs. In order to keep up with the demand for their lanterns, Copper Sculptures has to place large orders for copper on a monthly basis. Up until last year, when the operation of the business shifted to their children, Bill was a craftsman and Kathy handled sales and marketing. While Bill is still involved from time to time in his retirement, Kathy still maintains a consistent role at the business. “She oversees the big picture and is the conductor and makes sure everything is in tune,” Kimberly says. 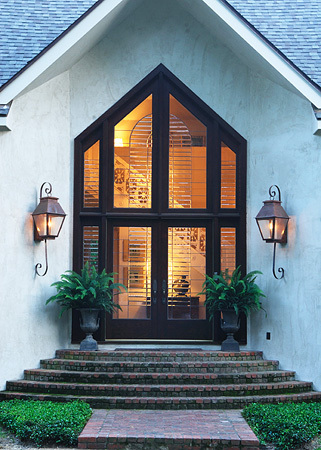 Jeremy emphasized the allure of the gaslight that makes it an appealing accessory to a homeowner and has kept their business thriving for all of these years.